Help us light up the world! Together let’s raise the visibility of Juvenile HD and HD. Thanks to local and national volunteers our LightItUp4HD campaign is gaining lots of attention. With the encouragement from volunteers across Canada (and even the globe!) we are expanding #LightItUp4HD. 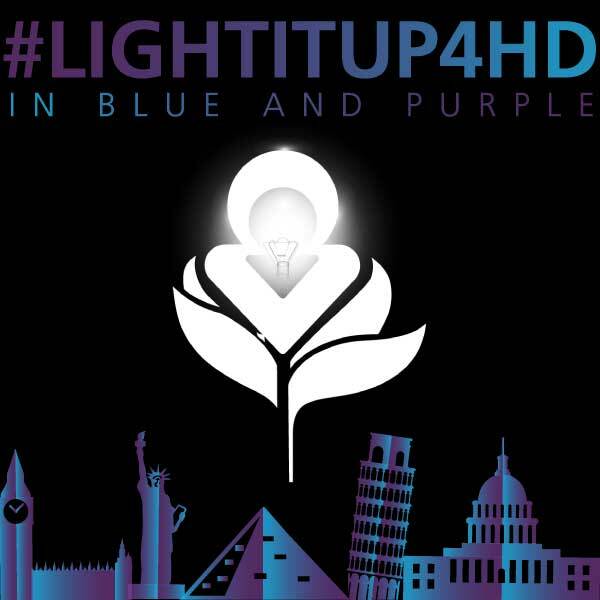 Let’s light up the world in purple and blue, for Juvenile Huntington disease (JHD) and Huntington disease (HD), throughout the month of May 2019! The more days we can light up, the more awareness we will bring to HD. Our goal is to #LightItUp4HD, somewhere in the world, each day of the month. Rather than one day, we are looking to celebrate May Awareness each and every day of May 2019. Want to see how we did last year? Check out this video from 2018’s #LightItUp4HD. If you would like to know more about the site involved, please click on it and you will be directed to their webpage. Don’t miss a single post, see what everyone’s posting with our official hashtag #LightItUp4HD! For Facebook posts, click here. For Twitter posts, click here. Let’s show the world what our global community can do! Join this growing movement! Choose a building, monument or statue in your area. Step 1: Email communications@huntingtonsociety.ca with your suggestion. Email us to with the name of the site you want to contact. We will confirm and add your site to the list. On to step two! Step 2: Contact the building, monument or statue. Find the contact information on their website. Call or email them directly and ask what the process is to light up the building, monument or statue. If they need more information about Light It Up 4 HD, you can provide them with this info package. Other materials include photo 1 and photo 2, as well as general HD materials like this poster and this brochure. Once you know the process, use this template, complete your information, and email it to the site. Step 3: Wait for confirmation. It could take a couple of days or even up to 4 – 6 weeks; if you don’t hear back, don’t be shy! Go ahead and contact them again. Step 4: Official confirmation. Some buildings, monuments or statues want official confirmation from HSC. That’s no problem just forward the request to communications@huntingtonsociety.ca and we will confirm you are working on our behalf. Please note: Most sites will need 6 – 8 months to prepare so, let’s start now! In 2018, 8 countries participated, with a total of 123 sites across the world – the highest number of sites secured to date! 52 of these sites were right here in Canada, with at least one site lit up in every province across the country.